Kilimanjaro allows only the chosen few – the most physically, mentally, and spiritually aware — to ascend its volcanic terrain and bask in all its ethereal glory. To become part of this exclusive club of hikers, you’ll need to heed the wisdom of those who have trekked successfully before you and obey the natural order when you’re climbing Kilimanjaro. 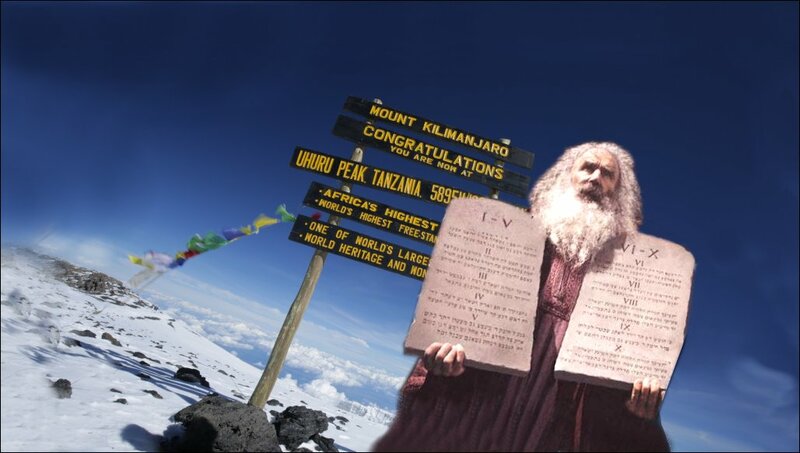 So here are the mountain’s Ten Commandments that — if followed — may lead to seeing the light at the top of Africa and achieving a glimpse of nirvana. Did you know that close to 10 people die every year trying to climb Mount Kilimanjaro? Though the trails are well-established, they’re by no means an easy feat. You’ll need 100% devotion and zero arrogance to make it to the top of Africa’s highest summit.It doesn’t matter how many YouTube videos or Instagram posts about climbing Kilimanjaro you’ve liked; you’ll still need to put in weeks of training and listen to the instructions presented on the trail and by your guides. Tell yourself you’re on a journey to learn as much as you can, abandon your ego, and let your inner guide connect with the mountain. “Nature does not hurry, yet everything is accomplished,” Lao Tzu said. There’s a reason climbing Kilimanjaro takes around 10 days from start to finish; our bodies are not made to ascend and descend mountains as quickly as eagles or gods. If you hurry up the mountain (or want to sprint down and begin your victory laps), you run the risk of developing Acute Mountain Sickness (AMS). Frequently referred to as altitude sickness, AMS is the physical distress your body goes through when it has a difficult time adjusting to lower oxygen pressure at high altitude, according to Healthline. Symptoms typically occur within hours of reaching 8,000 feet above sea level (Mount Kilimanjaro is 19,300 feet high, ps) and include dizziness, headache, shortness of breath, and nausea. Any of these can quickly sideline your ascent to the top. On the bright side: Research shows that for every day you spend acclimatizing, or slowly getting used to higher altitudes, you increase your chances of reaching the Kilimanjaro summit. An experienced guide has the wisdom of a prophet when it comes to climbing Kilimanjaro. Heed their advice, trust their counsel, and always listen when they tell you to slow down (or “Pole pole” as they say in Swahili). This also means buying/bringing all the gear and equipment outlined in your trail guide’s packing list. Though it may seem weird at the time, the experts know exactly what you’ll need when you’re thousands of miles from home. Since you’ll be spending loads of time with your trail guides, you should feel comfortable asking for water or to use the restroom (though you should always try to go before hiking). This also helps your guides keep tabs on your health and monitor for warning signs of AMS. There’s no room for negativity on Kilimanjaro. You’ll need to release those feelings of fear, anxiety, and worry and embrace the mountain’s spirit of positivity instead. You may be tired. You may get cold. You may get wet and feel miserable and want to turn around. So will your trail mates. That’s why it’s crucial to provide your team — your climbing brothers and sisters — with encouraging words and unwavering positivity. You’ll be there for them like they’ll be there for you. Kilimanjaro is a time for testing your strength, determination, and resilience, but it’s also a time for bonding and a chance to make friends for life. And don’t forget to share your trail photos with your trail mates; chances are they’ll have some snaps you’ll want to snag as well. One of the first purchases you make after you sign up for your Kilimanjaro hike should be your hiking boots. You don’t necessarily need the best hiking boots to reach the Kilimanjaro summit, but you’ll want to invest in the best pair your budget can afford. Never wear brand new boots on your first Kilimanjaro hike. Always break in your hiking boots by going on several long hikes (in the 4–6 hour range) before packing them for your adventure. One of the biggest reasons first-time mountain climbers flock to Kilimanjaro is because you don’t need any mountaineering experience to reach the Uhuru Peak. It’s highly achievable and incredibly rewarding with the right team and the right mindset. You may start to doubt yourself — you may tell yourself you have no business climbing the tallest freestanding mountain in the world — and that’s not the answer. Be confident in your ability to make it to the Kilimanjaro summit and you’ll get there. Convince yourself you’re worthy and you’ll have the selfies to prove it later. The goal of climbing Kilimanjaro is to reach the top. But that’s not the only reason to accept the challenge. Make it a point to revel in the mountain’s majesty – in the lush rainforest, melting glaciers, and the people living in its shadow — along the way. By being singularly focused on reaching the top, you’ll miss the experience and spiritual journey that is Mount Kilimanjaro. Your body may start to get used to the daily hikes, but summit days are brutal. Here’s where the trails will be steeper and colder until you reach the top of the mountain. You’ll be tested before being rewarded. So when you finally reach this holy place, refrain from yelling in ecstasy, dancing wildly, and boasting in the face of the gods. You should take quiet pleasure in the inner peace you have achieved. Save the ego trip and relish in your own spiritual journey. You and your fellow trail mates all have the same goal: reaching the Kilimanjaro summit. But our bodies are not all built the same. Regardless of your fitness level and weeks of training, you may not be as fast or able to lift as much as your trail companions. And that’s ok. If you don’t make it to the summit, you cannot harbor jealousy over your trail mates’ success. Climbing Kilimanjaro is as much a physical journey as it is a mental and spiritual one; what you learn and achieve on the mountain is entirely different than the journey your neighbors are on. While you revel in the mountain’s majesty, reflect on what you have accomplished. Should the yearning to reach the Uhuru Peak persist, use your trail mates as inspiration to summon the courage to try again. The popularity of climbing Kilimanjaro has created hundreds of operators willing to take tourists up and down the mountain for much less than others. In order to remain competitive, these agencies often cut corners and sacrifice your safety. Kilimanjaro is not the place to tighten your budget. While you don’t need to choose the most expensive company to take you up the mountain, you should look for a solid trekking outfit that doesn’t subcontract their climbs and runs them entirely within house. That means the company you’re booking your adventure with should be responsible for all the gear and equipment used on your Kilimanjaro hike — along with vetting the knowledge, expertise, and character of your guides and porters. Should an emergency situation happen, you only want to trust the best, most experienced guides on the mountain. Look for medically trained guides and access to doctors with wilderness experience. A reputable and trustworthy company should also provide adequate meals to keep you properly nourished at high altitude and warm camping and dining tents to make you feel at home when you’re not on the trails. Don’t risk your safety booking with a fly-by-night operator. It’s important to book your Kilimanjaro climbing expedition with experienced guides like Tusker’s. Experience matters when your life’s on the line. These 10 commandments of hiking Kilimanjaro will both guide you along the mountain trail and along your spiritual journey towards an enlightening, life-changing experience. You’ll never forget reaching the Kilimanjaro summit on your own and you’ll make lifelong friends who will always remember the best, most adventurous side of you. Now just one question remains: Are you ready to become a believer in yourself?